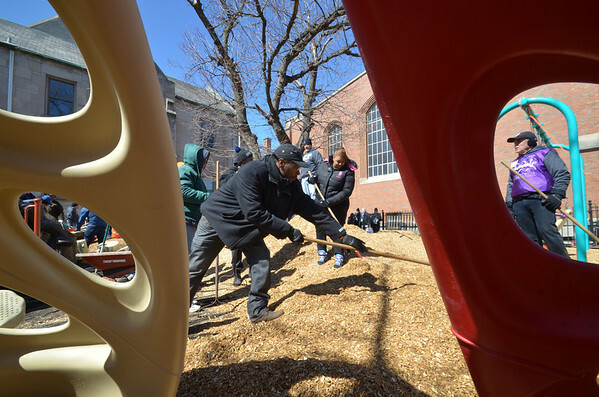 CHICAGO—Last fall, more than 60 children from the Auburn-Gresham neighborhood of Chicago drew the playground of their dreams during a Design Day event at The Faith Community of Saint Sabina. On Tues., March 19, 2013, hundreds of American Academy of Orthopaedic Surgeons (AAOS) and community volunteers will transform the children’s crayon and color pencil drawings into a reality. 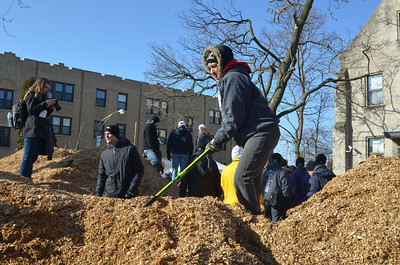 Since 2000, the Academy has sponsored a one-day volunteer build to kick-off its Annual Meeting, leaving behind a legacy of safe and accessible playgrounds to the Annual Meeting’s host city so that children with and without disabilities can safely play together. 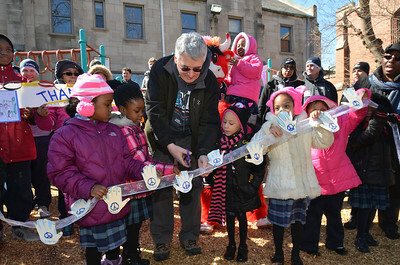 This will be the Academy’s second Safe and Accessible Playground build in the Chicago area. 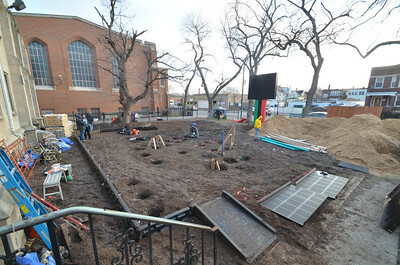 The new playground at St. Sabina will have a 2,764 square-foot area featuring a safety sign in Braille, playground components for children between the ages of 5 to 12 and of different abilities, a slide, two climbers, audible activities including bell, horn and drum panels. The site also will include wheelchair ramps, a “cozy cocoon” designed for children with autism spectrum disorders, and interactive panels with numbers and letters. 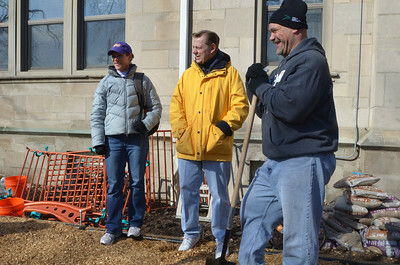 Volunteers from AAOS, the local community and national non-profit organization KaBOOM! 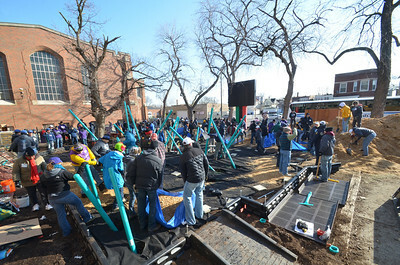 will come together to build the playground in less than eight hours. Special guests include Chicago Bulls mascot Benny the Bull, Illinois State Senator Jacqueline Collins and Representative Mary Flowers. Each year, more than 220,000 children in the U.S. are injured on playgrounds—the most common injury is from falling off monkey bars—where they will require medical attention. Orthopaedic surgeons are the physicians who treat many people with physical disabilities. They see first-hand the fractures, dislocations and other results of playground injuries and falls. 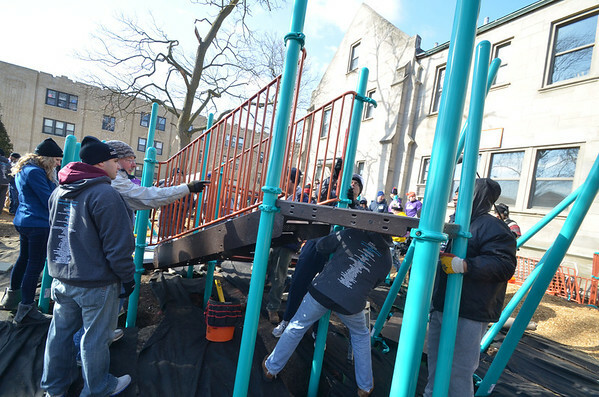 The Safe and Accessible Playground Build is an opportunity for orthopaedic surgeons to give back to the Academy’s Annual Meeting host city. This playground will offer children exercise opportunities for balance, flexibility, and strength which help build strong bones. For more information about the Safe and Accessible Playground and the list of sponsors, visit aaos.org/playground. Follow Build Day progress, or view day-of status updates and photos, at #WhyIBuild. An orthopaedic surgeon is a medical doctor with extensive training in the diagnosis and non-surgical as well as surgical treatment of the musculoskeletal system, including bones, joints, ligaments, tendons, muscles and nerves. With more than 37,000 members, the American Academy of Orthopaedic Surgeons (aaos.org or orthoinfo.org) is the premier not-for-profit organization that provides education programs for orthopaedic surgeons and allied health professionals, champions the interests of patients and advances the highest quality of musculoskeletal health. Orthopaedic surgeons and the Academy are the authoritative sources of information for patients and the general public on musculoskeletal conditions, treatments and related issues. More than one in four Americans have bone or joint health problems, making them the greatest cause of lost work days in the U.S. When orthopaedic surgeons restore mobility and reduce pain, they help people get back to work and to independent, productive lives. Orthopaedic surgeons keep this “Nation in Motion.” To learn more about the “A Nation in Motion” campaign, or to read hundreds of patient stories or to submit your own story, visit ANationInMotion.org. 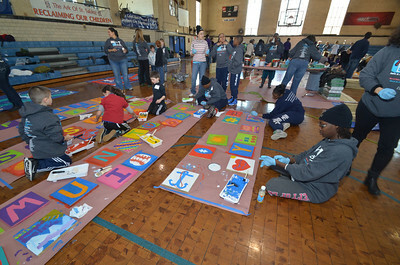 The Faith Community of Saint Sabina is an African-American Catholic community of faith, education and service that believes in the power of praise and worship. St. Sabina’s purpose is to nurture and develop spiritually mature Christians who are trained leaders and who are not confined by the walls of the sanctuary, but can penetrate the world in order to present God’s way of living as a divine option. KaBOOM! is the national non-profit dedicated to saving play. Children today spend less time playing outdoors than any previous generation, a fact that is having disastrous consequences on their health, achievement levels, and overall well-being. To fight this Play Deficit, social entrepreneur Darell Hammond founded non-profit KaBOOM! 15 years ago in Washington, D.C. with a vision of creating a great place to play within walking distance of every child in America. Since then, KaBOOM! has mapped over 85,000 places to play, built more than 2,200 playgrounds, and successfully advocated for play policies in hundreds of cities across the country. KaBOOM! also provides communities with online tools to self-organize and take action to support play on both a local and national level. Hammond chronicles the founding of the organization and the importance of the cause of play in his The New York Times Best Seller KaBOOM! : How One Man Built a Movement to Save Play. The book details how businesses and communities can work together to save play for children across the country. All author proceeds support KaBOOM!. Headquartered in Washington, D.C., KaBOOM! also has offices in Chicago and San Mateo, Calif. For more information, visit kaboom.org.